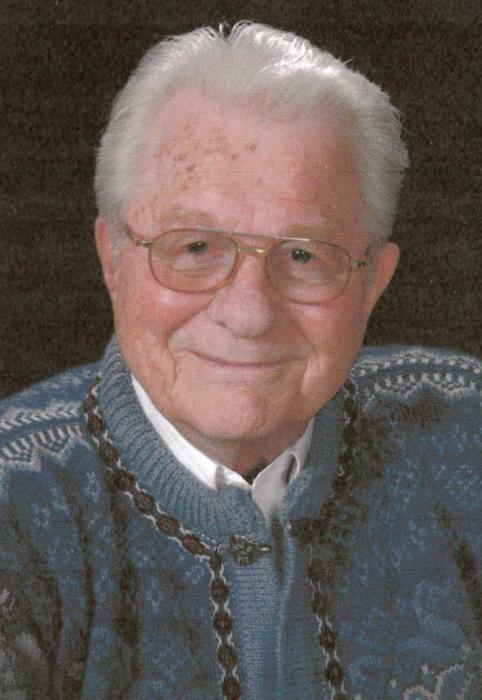 Dwight Gene Dwello, 93, passed away Tuesday, October 16, 2018 at the Libby Care Center where he had been a resident for 4 ½ years due to dementia and post polio syndrome. He was born April 27, 1925, the sixth of eight children, to Fredrick Ellis and Agnes Sophia (Lyng) Dwello at Granville, ND. Dwight was baptized on July 31, 1932 at First Lutheran Church in Granville and he was confirmed at the same church on May 14, 1939. He graduated from Granville High School with the class of 1944 and was Salutatorian of his class. In school he couldn’t do some of the sports due to complications from polio, so he became active in the Glee Club and played the trumpet in the high school band. He then attended and graduated from the Industrial and Teacher’s College at Ellendale ND, in 1948, with a degree in Business Education. Dwight was in the boxing program during his college years, sang in the choir and played his trumpet in the college dance band. They played for many dances in the area. In 1948 he got his first teaching job at Fairmount, ND where he taught all the business classes and was the Year Book Advisor and the Senior Class Sponsor. It was in Fairmount where he met Katherine Hoefs, his future bride. They were married June 4, 1950 at the First English Lutheran Church in Fairmount. Dwight accepted a teaching job in the fall of 1950 in Geraldine, MT. He taught all the business subjects plus taught the band for 2 years. In 1956 he became the High School Principal. They began to raise a family during their stay in Geraldine. Kelvin Gene was born in 1954, Kurtis Wayne was born in 1956, and Gary Ellis was born in 1960. Dwight accepted a teaching job in Libby after being in Geraldine for 12 years. He taught Business Education and Drivers Ed; a job he had for over 20 years. He was also offered a job as manager of the Teacher’s Credit Union, which he held for 27 years. When his boys were young, he was kept very busy attending Boy Scout events, Little League Baseball games and all their school activities. He loved sports of all kinds. Dwight retired from teaching in 1982 after 34 years. However, he was not ready to retire from working completely, so he was offered a secretarial job at the high school and held that job for 13 years. Dwight was a past member of the Libby Education Association, the Montana Education Association and a lifetime member of the National Education Association. In 1995 he and Katie became “snowbirds” and went to Yuma, AZ for the winter. They did this for 20 winters. Dwight enjoyed camping with the Libby Dam Good Sam Club and he was a 40 year member of the Sons of Norway. In 1992 he was crowned the King of Nordicfest. He was very proud of his Norwegian heritage. Dwight was an active member of the St. John Lutheran Church, having been president of the congregation, sang in the Praise Choir, and helped with the youth group. He was on the Rural Fire Board for many years. He loved his family, friends and especially God. Dwight was preceded in death by his parents; 5 brothers - Ellis (Mary), Glen (Laney), Robert (Christine), Earl (Elsa) and Howard (Lyla); 2 sisters - Esther (Gene) Anfinson and A. Muriel Dwello; his mother and father in law Herbert and Sophia Hoefs; and brother and sister in law Kenneth and Betty Hoefs. Survivors include his wife Katie of 68 years; sons - Kelvin, Boise, ID; Kurtis (Becky), New Meadows, ID; Gary (Susan), Caldwell, ID; 10 grandchildren - Bethany (Stacey) Mello, Nampa, ID; Zachary (Danielle) Dwello, Nampa, ID; Katie (Danny) Brown, Kinnear, WY; Lauren Dwello, Orange, CA; Garret Dwello, Dublin, CA; Sean Dwello, Salt Lake City, UT; Steven Dwello, Boise, ID; Stuart Dwello, Canberra, Australia; James Dwello, Nampa, ID; Jonathan Dwello, Caldwell, ID; 8 great grandchildren - Madelyn and Briarus Mello, Nampa, ID; Jordyn, Clayton, Rustin and Brooklyn Dwello Nampa, ID; and Killian and Maura McCall Kinnear, WY; sisters in law Shirley Hoefs, Breckenridge, MN; Ardis (Orville) Smith, Greenwood Village, CO; many nieces and nephews and great nieces and nephews and several cousins. Visitation will be from 1:00 – 7:00 p.m. Thursday, October 25, 2018 at Schnackenberg Funeral Home in Libby. Services will be at 11:00 a.m., Friday, October 26, 2018 at St. John Lutheran Church, 1017 Montana Ave, Pastor Steven Thomas presiding, with burial to follow at the City of Libby Cemetery at 1:00 p.m. . Memorials may be made to St. John Lutheran Church or any charitable organization of the donor’s choice. Online condolences and memories may be shared at www.schnackenbergfh.com.